There are hundreds of varieties of aloe plants, these plant are indigenous to Africa and a few neighboring areas. Aloes come in many varieties that range in size from a few inches to tree heights of 30 to 40 feet, in the case of the kokerboom (or quiver tree). They also come in many colors and shapes, including orange-hued, purple-tinged, and with various spine configurations. Some aloes also producing flowers. Though many people might think of the aloe plant as a cactus, it is actually a succulent plant. If you don’t live in the tropics, you can plant Aloe vera indoors as a house plant, so you can always have it on hand. Aloe vera is an amazing tolerant houseplant. It will grow well with low light (though it prefers strong sunlight) and thrives on infrequent watering (overwatering is far more likely to kill it). And if aloe gets too dry, too cold, or gets too little light, it may look reddish and the leaves may get somewhat flattened, but it will usually hang in there, waiting for better condition. Another important things about Aloe vera is of how to water the plant properly. The media of the aloe vera plant should be allowed to go completely dry before being watered. When the plant is watered, the soil should be thoroughly drenched, but the water should be allowed to drain freely from the soil. The most common reason an aloe plant dies is that the owners water too often or do not allow the media does'nt have a good drainage system. It is important to avoid this mistake when taking care of aloe houseplants. Aloes generally don’t need to be fertilized, but You can fertilize your aloe vera plant if you want. If you decide to add fertilizing to part of your aloe vera plant care routine, aloe vera plants should be fertilized once a year in the spring. You can use a phosphorus-heavy, water-based fertilizer at half strength. 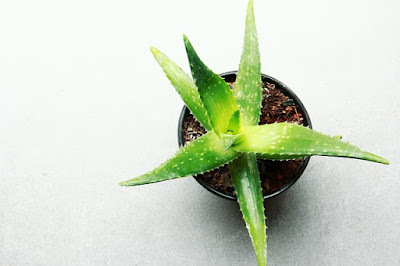 Growing aloe vera as a houseplants is not only easy but can also provide your family with a plant that can help treat minor burns and rashes. Now that you know a little more about how to care for an aloe vera plant, you need never be without this lovely and helpful plant.